I have another one which looks more authentically Carmelite-y, but this one is also good and getting the other would mean I have to go and disturb my almost-asleep two year old. Not happening. One day maybe I’ll write an article about the history, spiritual significance, and practice of the wearing of a scapular. I can’t quite face that right now. Instead, let’s just say that it is a form of silent prayer and a very beautiful and deeply meaningful Catholic tradition. You can read this if you’d like know more about the ins and outs of it, or want a refresher. I was enrolled in the brown scapular by a Discalced Carmelite priest 100 years ago* but haven’t worn it in many years. I began wearing one daily again as part of my challenge to do 40 things before I turn 40. I’ve actually already done two things on my list – I bought a beautiful dining table and chairs – but the table’s still in pieces from when we brought it home. Starting a nearly 10pm to set it all up to take a photo for my blog would disturb the sometimes delicate Rodrigues family harmony even more than me risking waking the now-sleeping children by riffling through my bedside drawers for my favourite scapular right now. 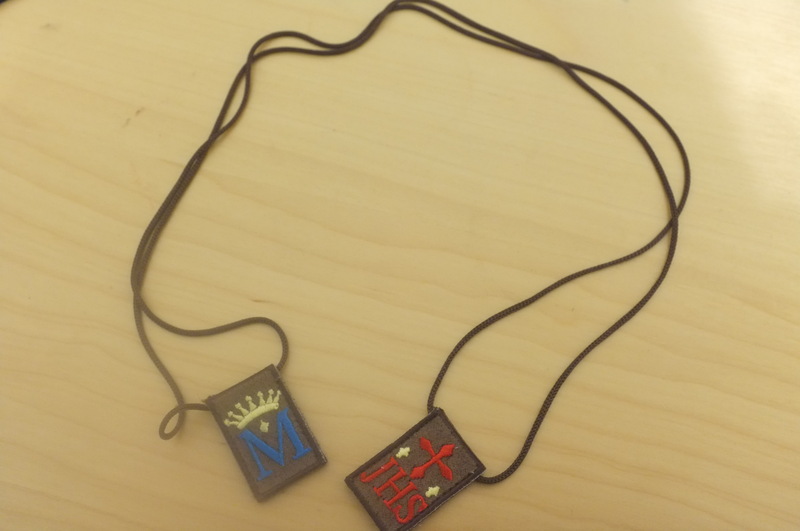 If you’ve ever thought – like I did for about five seconds – of getting a tattoo of a scapular to save you trouble of actually wearing one and because it seems a lot cooler than wearing two scratchy old bits of cloth around your neck, then I recommend you read this from the wonderful Sister Mary Martha. Oh, and this as well. Absolutely hilarious. Go on, see if you agree with me that she is one very talented lady (though probably not a nun). * It might have been more like 19 years ago, it just feels heaps longer. ** Completely unrelated, but I really loved Pope Francis’ speech at the end of the opening synod on the family this week. Did you see it? Oh please please where did you get the scapular in this photo? I love it. Would love to wear one as well! Hi Christopher, I was given the scapular pictured. You can order it, with an information brochure, from Australia Needs Fatima (https://www.fatima.org.au/product-category/medallions). If you’re in another country though, maybe try the Traditional Family Property organisation there, or of course the Carmelites.